TYF contributor, Shane A. Bassett, interviewed the cast, director and producer of Hansel and Gretel: Witch Hunters on the red carpet at the Australian premiere. Sydneysiders came out in droves to see the stars at the Australian premiere for Hansel & Gretel: Witch Hunters. Fitting with the macabre theme of the film, the red carpet was actually white with blood splattered stains all the way down. Waiting my turn beside a temporary stick forest, a snow machine blasted me with fake flakes. 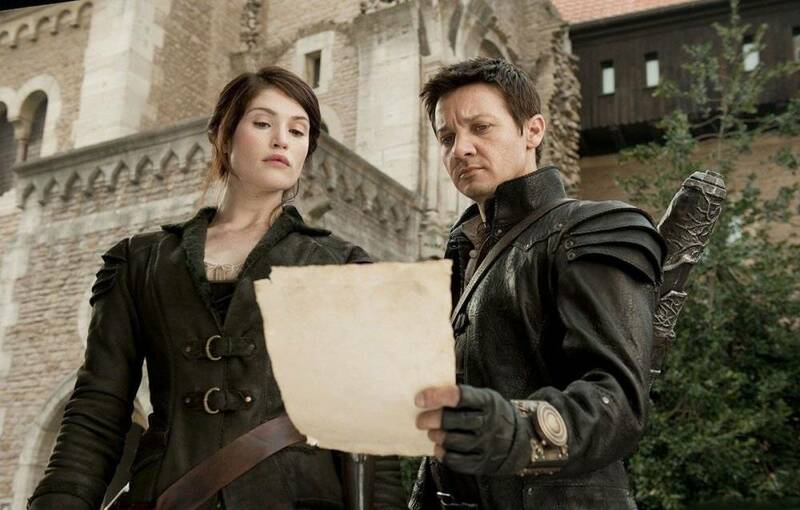 Former Bond girl, British-born Gemma Arterton was angelic, while Jeremy Renner looked sharp in grey. Shane A. Bassett (SAB) – Hi Gemma, you look fantastic, lovely to meet you, Happy Birthday for this Saturday (Feb 2nd). I’ve just had mine, we are both Aquarius. SAB – How did you get in and out of those remarkable costumes? GA – With a lot of help (laughing). It took a while to get into them; it was a good thirty minutes every morning to get it all on, and they were pretty tight those pants. Some days they were tighter than other days especially after a weekend. SAB – How did you cope with the stunts? GA – One of the best things was getting down and dirty, covered in mud. SAB – Disappearance of Alice Creed and Tamara Drew really showed your dramatic ability and poise; do you prefer those kinds of roles? GA – Yes, I do lots of theatre as well, so that’s where I think my best creativity is set free. It depends on the project too; sometimes you don’t have the same flexibility. Suddenly Gemma notices a person behind me, behind the security and says…. “Oh My God! !…..that’s a face I didn’t think I’d see, hello” (waving at the lady who waves back). Now grabbing my arm, Gemma continues. GA – I am sorry; we did a movie together. Where were we….yes you have a bit more flexibility on smaller dramatic roles, not so big or under pressure like the blockbusters. This is my year of independent filmmaking. I have four smaller movies coming out. SAB – I think you and Jeremy had great chemistry, and I am so happy it has become a successful film. GA – Thank you, and happy birthday. Jeremy Renner (JR) – Hey whats up, pretty quick yehh, a whole another season. SAB – This role is not something you would normally do; what drew you to the character? JR – It was a big departure from anything I have done before, and I just thought it would be a lot of fun and certainly it was. We had A LOT OF FUN (laughing). Audiences seem to like it too; that’s the most important thing. SAB – What was the hardest and the easiest part of filming? JR – The hardest thing about it was going home; I was having such a good time, while the easiest was getting up and going to work every morning. SAB – Happy Birthday for earlier this month, just had mine too. JR – Thanks man. Oh right, well, happy birthday to you. SAB – What can you tell me about your upcoming collaboration with (Director) David O’Russell, is it confirmed? JR – Yes, it’s confirmed. We start up in about a month or so, very excited about it. I get to work with David, Bradley Cooper, Amy Adams and Christian Bale. It’s a tremendous cast. It seems I have a lot to learn from those people; it’s going to be tremendous. I’m excited to work with them. SAB – Your selection of directors is impeccable. Thanks Jeremy, and let me just say Hansel & Gretel is like your first comedy. JR – (Laughing) You’re right! Thanks, man. Next up was producer Kevin Messick. SAB – Did you work with Director Tommy Wirkola from the concept, bringing this film from the ground up to the big screen? Kevin Messick (KM) – I saw Tommy’s movie Dead Snow at the Sundance Film Festival a few years back. Fantastic film. As soon as I saw it I came home when I had just started working for the Adam McKay/Will Ferrell production company. So we brought Tommy in, and we were his first official Hollywood meeting. That’s where he pitched us the story. He had all the basics of it of what he wanted to do; we loved it, so we took it to Paramount right away. SAB – Looking back at your earlier movies when starting out, did they prepare you for this? KM –Well, of course, but nothing can prepare you for trolls, witches, sabbaths and fighting in the forests of Berlin; so it became a big learning curve for everybody, but a fun one. SAB – It’s such a departure for Jeremy Renner; was it hard to get him on board? KM –We were lucky; he had just done Hurt Locker at the time we had approached him. We sent him the script and some early artwork. It really struck a chord with him; it was probably like two and a half years ago, before he had booked M.I.4 and Avengers. We were thrilled; I thought we had really lucked out and we did. He’s the man. Last but not least, Director Tommy Wirkola. SAB – Very pleased to meet you, and before I start, I thought Dead Snow (Wirkola’s 1999 film) was an extraordinary film, mate. I still think about the affect it had on me. Tommy Wirkola (TW) – Well, thank you very much. SAB – Anyway, congratulations on Hansel & Gretel being the number one movie in many countries around the globe right now. I believe this was your baby from concept, and you always wanted it to be your foray into Hollywood. TW – I was always fascinated by the fairy tale; people forget how dark and twisted those stories really are. I was scared to death when I heard them as a kid; I always wondered what happened to them after the end of the story. The actual fairy tale reads like a first act of a film. You leave those characters in an interesting place; so for me, it was just taking that, then adding humor and action to them. SAB – Jeremy was fantastic in the film. His brotherly chemistry with Gemma was also extremely believable; was Gemma always the first choice? TW – We got Jeremy first; he was on board really early, and it was always about finding the right combination. She came in late in the process actually, after I saw a film she made called The Disappearance of Alice Creed. I loved her performance in it; she was so strong, but at the same time had that vulnerability about her. I went to London; I read with her, and she was amazing. But of course, when you’re casting a brother and sister, you have to make sure they gel. But we got them in a room, they loved each other, and we knew we had our leads. SAB – Any ideas for a sequel? TW – We haven’t really thought about it that much to be honest. I am from Norway; we don’t take things for granted, but it certainly would be a fun place to go back to if people were interested? SAB - How did you get in and out of those remarkable costumes? SAB - How did you cope with the stunts? SAB - Disappearance of Alice Creed and Tamara Drew really showed your dramatic ability and poise; do you prefer those kinds of roles? SAB - I think you and Jeremy had great chemistry, and I am so happy it has become a successful film. SAB - This role is not something you would normally do; what drew you to the character? SAB - What was the hardest and the easiest part of filming? SAB - Happy Birthday for earlier this month, just had mine too. SAB - What can you tell me about your upcoming collaboration with (Director) David O’Russell, is it confirmed? SAB - Your selection of directors is impeccable. Thanks Jeremy, and let me just say Hansel & Gretel is like your first comedy. SAB - Did you work with Director Tommy Wirkola from the concept, bringing this film from the ground up to the big screen? KM – Well, of course, but nothing can prepare you for trolls, witches, sabbaths and fighting in the forests of Berlin; so it became a big learning curve for everybody, but a fun one. SAB - It’s such a departure for Jeremy Renner; was it hard to get him on board? KM – We were lucky; he had just done Hurt Locker at the time we had approached him. We sent him the script and some early artwork. It really struck a chord with him; it was probably like two and a half years ago, before he had booked M.I.4 and Avengers. We were thrilled; I thought we had really lucked out and we did. He’s the man. TW - We got Jeremy first; he was on board really early, and it was always about finding the right combination. She came in late in the process actually, after I saw a film she made called The Disappearance of Alice Creed. I loved her performance in it; she was so strong, but at the same time had that vulnerability about her. I went to London; I read with her, and she was amazing. But of course, when you’re casting a brother and sister, you have to make sure they gel. But we got them in a room, they loved each other, and we knew we had our leads. SAB - Any ideas for a sequel? TW - We haven’t really thought about it that much to be honest. I am from Norway; we don’t take things for granted, but it certainly would be a fun place to go back to if people were interested?